The tranquillity of the Innere Salzkammergut and endless kilometres of pristine white splendour opens out before you! Snow-shoe hiking is probably one of the most relaxing types of winter sports – especially when you head out on a guided tour and can really put your trust in your guide ...! Give it a go - so many inveterate boarding fans have, according to Wikipedia, already been convinced by this "tennis racket like" winter sports equipment! The possibilities on offer in the Freesports Arena Dachstein Krippenstein are endless on snow shoes! Hundreds of square kilometres of non-tracked splendour and the best guides make it possible for you to have an almost meditative experience on what is the most fascinating of all the mountains. Afterwards snow-shoe hiking on the flat is relatively easy, however going uphill and downhill can provide a challenge; Krippenstein provides the right terrain for every ability level. at Outdoor Leadership in the valley station of Dachstein Krippenstein cable car by phone +43 6135 6058. Experience an unforgettable day with expert snow-shoe guides and mountain guides! Discover on the three signposted (yellow snowshoe signs on red posts, approx. 30 m apart) and groomed snowshoe trails the charming winter landscape at the Krippenstein with best view on the Dachstein glacier. lead you to the most beautiful and breathtaking viewing points of the Salzkammergut. From the Krippenstein mountain station, it goes directly under the third section of the cableway line, passing on through in a SW direction. After 50m approx. you come across several little lodges. Beyond the lodges follows a short and somewhat steep incline. Then after that it’s approx. 150m further to the east, and you’ll have reached your destination. From the ’Welterbespirale’ you’ll have a 360-degree panorama over the surrounding Alpine world. Then it’s back the same way you came. From the Krippenstein mountain station, it goes directly under the third section of the cableway line, passing on through in a SW direction. After 50m approx. you come across several little lodges. Beyond the lodges follows a short and somewhat steep incline. It’s approx. 100m further in an easterly direction until you reach the Heilbronner Chapel. Now it goes down a few metres to your left and then right again for approx. 200m slightly down the mountainside until you enter a dip. Past this dip, the path gently climbs up onto a hilltop. Once you’ve reached the top, it goes slightly down to the left over a small snow cornice. Then after 50m further slightly to the right, you’ll have reached your destination. And it’s back the same way you came. Info – the route guidance may change depending on the snow situation. No snow shoes? Hire them! You want to test/try snow shoe hikine? you can hire snow shoes at a favourable tariff. The trail starts at the mountain station on the Krippenstein, where the signposted snow shoe trails begin. The path first takes you along the ski slope for about 15 minutes towards the chairlift valley station where you’ll come to a platter lift in the hollow. After you cross the lift path at the top end, you’ll be leaving the secured skiing area. It now goes first downhill slightly over open terrain before you then go up again, gaining approx. 15 metres of altitude. At this point you’ll also find the little Krippenstein ice cave, which you can explore for yourself when the snow conditions are reasonable. About 50m beyond the ice cave, the path branches off semi-left and you follow a slight inclination for approx. 20 min. in a northeasterly direction until you reach the Dachstein shark. And it’s back the same way. When you walk back, the ‘Lodge on the Krippenstein’ is always well worth a visit. Don’t miss: coffee and home-made apple strudel on the viewing terrace. This is of course just an excerpt of the tour suggestions and the varied offer in the extensive Dachstein area. Any tour can of course be individually tailored to suit your needs! We recommend you an organized tour with a mountain guide for an individual snowshoe tour! Information doesn’t replace scrupulous tour planning!! For your safety – please keep in mind: the Krippenstein imposes natural limits – even on snow-shoes you are exposed to the corners and edges, avalanches and sinkholes in the mountains! Inexperienced and those who do not know the area well are definitely advised to join a mountain guide, or a guide who knows the area. In spite of the easy accessibility of the Dachstein plateau by cable cars, please don’t forget that you are in high Alpine terrain. We assume no liability. Each guest is directly responsible for themselves and should be able to assess their own fitness levels. Keep in mind: In the open terrain there are sinkholes (collapses or funnel-shaped hollows in the earth’s surface, which have arisen from stones in the bedrock coming loose or from caves collapsing)! Keep an eye out for a potential change in the weather – signs to look for are wind picking up, fog, and temperature increase. Pay attention to the avalanche warning lights and notice boards. Follow the instructions of the piste patrol and the rescue service. Never rely on tracks already made in the snow! They do not guarantee your safety from avalanches and could take you in a completely wrong direction – or straight into a sinkholes. Save the phone no. 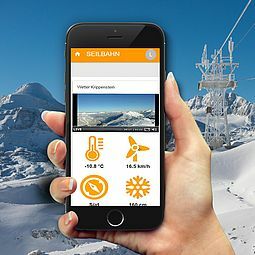 for the lift operating company (+43 50 140) and the mountain rescue service (140) to your mobile for emergencies. If you should find yourself in a hollow without reception, take out your SIM card and dial 112. For long distance walks off the trails: Take emergency equipment with you as a matter of course (avalanche transceiver, avalanche probe, shovel, First Aid kit and a mobile)!